Bass Pro Shops Free Easter Event April 8-15, 2017 - Free crafts Decorate a foam picture frame Saturday and Sunday April 8 & 9, 1 - 4 PM, Free crafts Create a tree stump bunny box Saturday April 15, 1 - 4 PM, Free 4 x 6 Photo (Saturdays 11 AM - 6 PM, Sunday April 9 11 AM - 4 PM, Monday - Thursday 6 - 8 PM), Free Easter egg hunt! Saturday April 15 only starts at 2 PM registration 1:30-2PM, Ages 2-10 find 5 eggs and retursn for candy. Free persoalized email video easter card to share online with friends and family! valid email required. 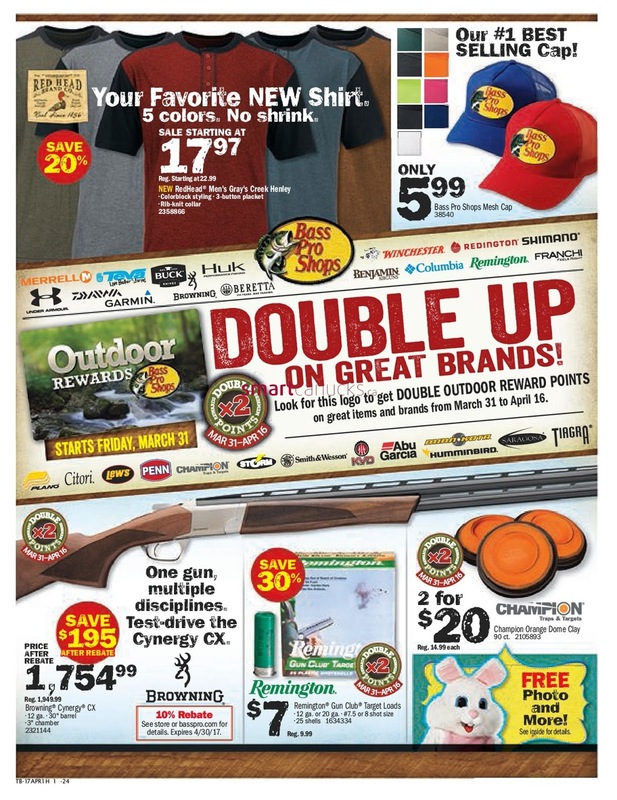 Notr a digital download post and share with #BassProEaster. 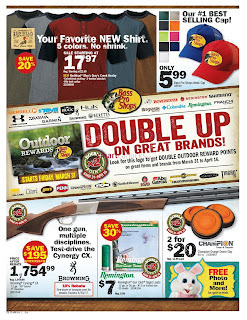 Cover page on Bass Pro Shops Flyer April 8 - 15, 2017, Your favorite new shirts 5 colors, no shrink sale starting at $17.97, Our #1 Best selling cap only price 5.99, Outdoor rewards Bass pro shops starts friday, march 31.